In January, the world wagered for weeks on what America's new First Lady would wear to her husband's historic Inauguration. 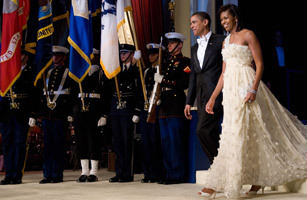 Michelle Obama didn't disappoint, choosing an ivory chiffon gown by Manhattan-based newcomer Jason Wu. It was a look that evoked new beginnings, not to mention nuptials. The nod from the First Lady changed the course of the 26-year-old Taiwanese American's career, launching his name into the global blogosphere and nearly tripling orders from department stores.